I think I am going to change my Sunday feature to Sunday Cinema, because our favorite thing to do on Sunday is to watch movies. 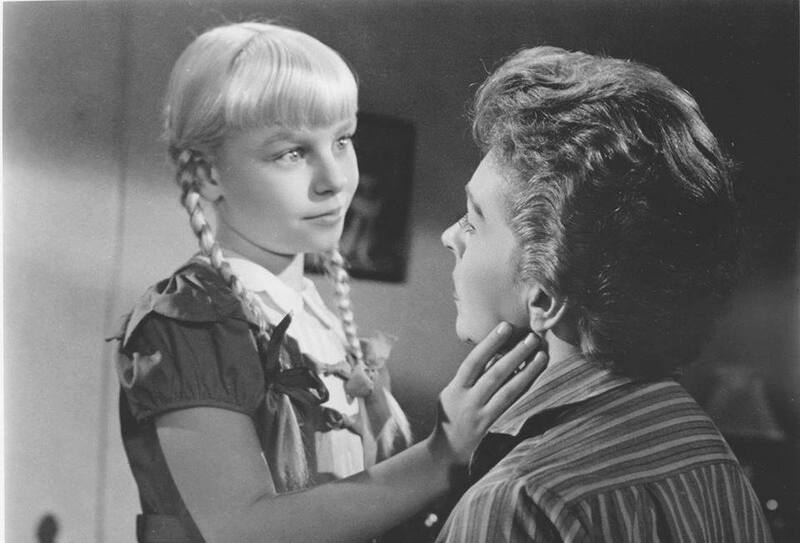 We have been enjoying a few flicks today, and I will list them, with illustrations. Hugging with eyes open is, of course, movie and TV shorthand for being up to no good. 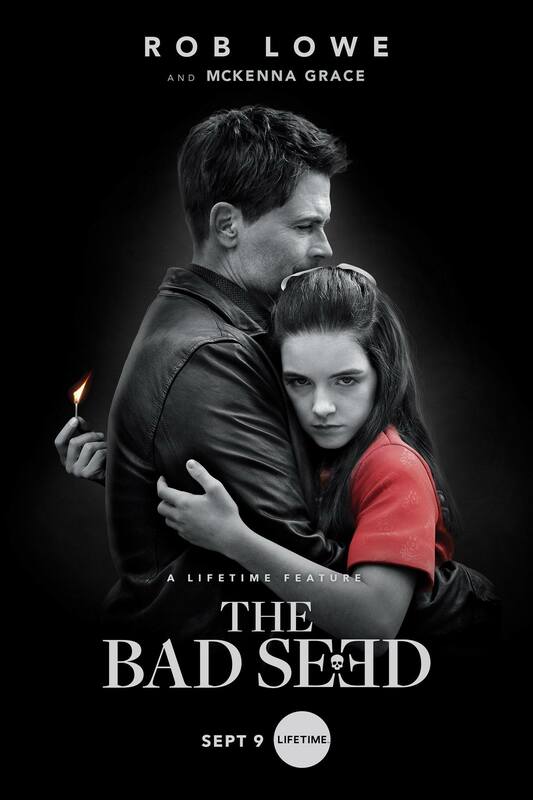 We DVR’d The Bad Seed some time ago (oh, Sept. 9, according to this poster I found on Facebook) and finally got around to watching it today. What a disappointment! We are longtime fans of the 1956 movie with Patty McCormick, although we have problems with that one too. I may write an entire blog post about it, but, um, not today. Check out the psycho eyes! 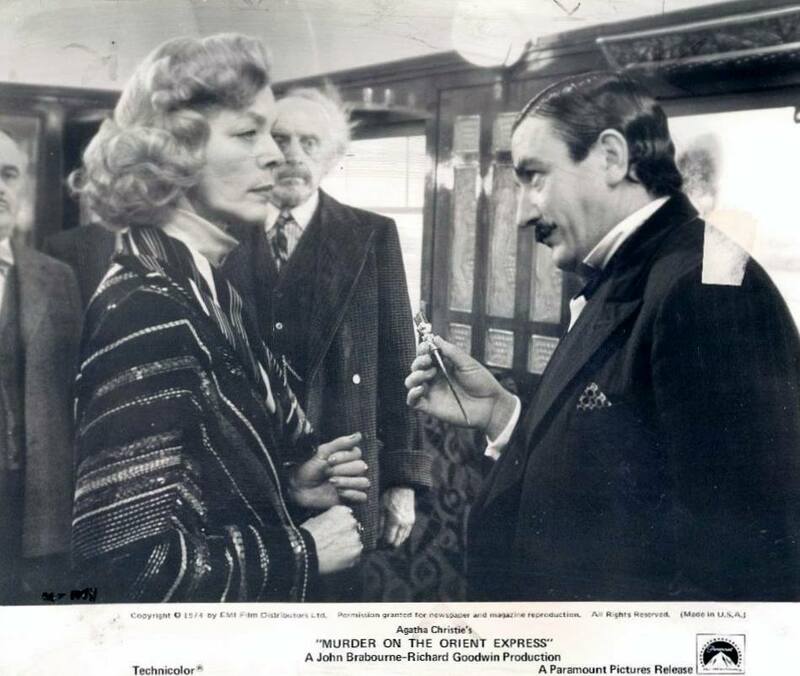 Next Steven suggested we watch Murder on the Orient Express (1974), because yesterday was Agatha Christie’s birthday and today is Lauren Bacall’s. We have yet to catch the 2017 remake of that. Rats! This could have been Remake Sunday! It lacks alliteration, but I like it. 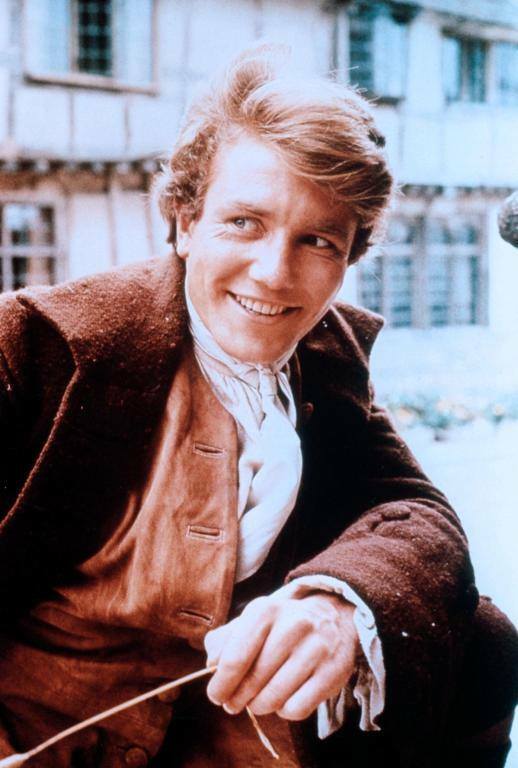 There’s the birthday girl, with another favorite of ours, Albert Finney (I don’t know who the fellow in the background is, although the one cut off is Martin Balsam). 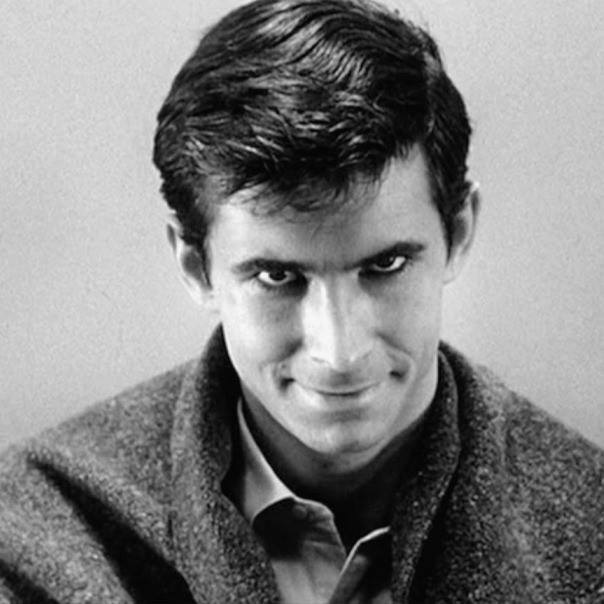 Next I got to pick and I chose Psycho (1960), because it is a Halloween movie. After Psycho I put on Snapped, but Steven preferred to watch another movie. He decided to continue the Agatha Christie theme with Witness for the Prosecution (1957). I am delighted to see this old favorite again. 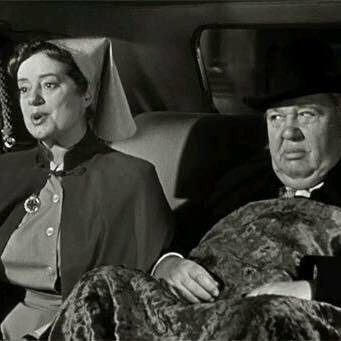 Two more of my favorites: Elsa Lanchester and Charles Laughton. So now I must stop blogging and go back to movie viewing. After all, it is Agatha Christie. Happy Sunday, everyone. Posted in humor, personal, Sunday Cinema and tagged agatha christie, blog post, blogging, entertainment, Lauren Bacall, movies, Murder on the Orient Express, psycho, remakes, The Bad Seed, Witness for the Prosecution. Bookmark the permalink. 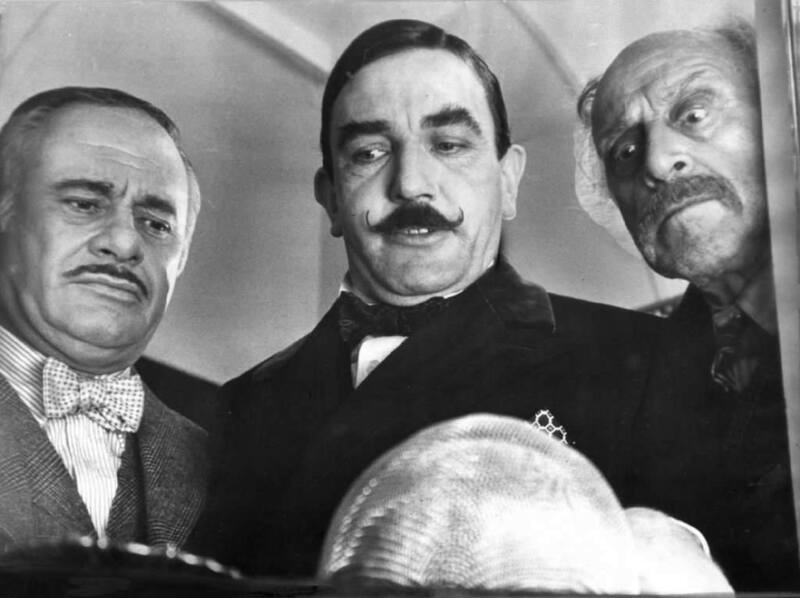 Can Hercule Poirot Solve My Doodah Dilemma? It is Wednesday, isn’t it? It’s that day when you want to be happy that there is only one more day between you and Friday (if you are fortunate enough to have weekends off, which I do and I am grateful for) (don’t hate me if you don’t), only you’re not, because you just realized you ARE going to do a theatre thing on Friday that you thought you were not going to do, so you only have one day to get a costume together. Yes, it’s always drama with me. It’s not even a real theatre-y thing I have to do: merely, Ilion Little Theatre is marching in the Doodah Parade as part of Ilion Days on Friday, July 20. I don’t even have to march: my friend Kim said I could ride in the truck. I don’t even have to wear a costume. I could wear my t-shirt from Roxy, a play I was in a few years ago (perhaps you read some of my blog posts about it). However, I am the sort of person that when I CAN wear a costume, I DO. What to wear, what to wear, what to wear? Something bold enough to show up as a costume from the truck, but something light enough to not kill me in 88-degree weather. Maybe a hat. Maybe an umbrella. I’d like to wear my tiara, but I don’t have a fancy dress. I have one day to get to a thrift store! How do I get myself into these things! In the meantime, I just spent some two hours sitting crocheting and watching Murder on the Orient Express (1974) with my husband, Steven. I can’t even begin to tell you how delighted I was that I could work on an afghan in comfort, in between hot flashes, even if I had to have the fan on me to do it. At least I can pep up my Wuss-out Wednesday post with a picture. 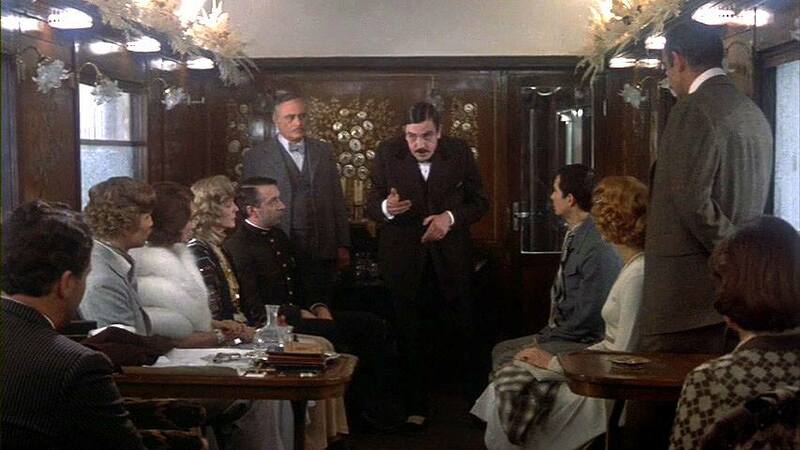 Hercule Poirot tells them what’s what. This was the first star-studded Agatha Christie romp Steven and I enjoyed together, back in the 1990’s. 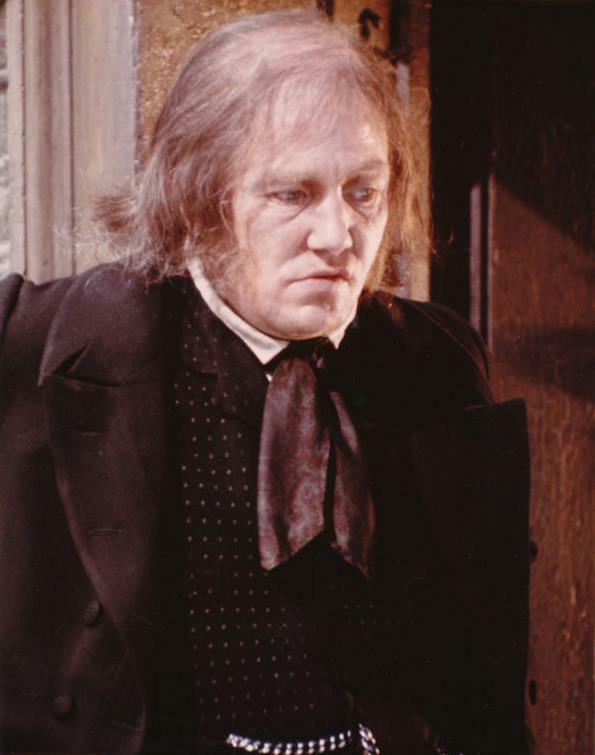 He had seen it in the theatre when it came out in 1974. We need to see the newer Kenneth Branagh version. Perhaps I’ll write a blog post about it when we do, although I usually write about older movies, preferably the cheesy sort. In the meantime, I see I am close to 400 words. That’s respectable for a blog post, especially on Wuss-out Wednesday. Anyways, now that the movie is over, I have to get back to having my panic attack over what I’m going to wear to the Doodah Parade. Posted in humor, personal, Wuss Out Wednesday and tagged blog post, community events, costume, DooDah Parade, Hercule Poirot, Ilion Days, Ilion Little Theatre, Ilion NY, Murder on the Orient Express, panic attack. Bookmark the permalink.